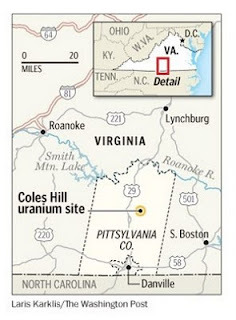 Virginia Uranium wants to mine uranium in Southside, Virginia. A state-ordered study, conducted by RTI International for the Danville Regional Foundation, released last week predicted the creation of jobs (up to 1,000) and an economic boost to the beleaguered Southside economy ($70 million to $220 million). But, it also says, that “even if the mine and mill meet or exceed regulatory standards, detectable concentrations of uranium and other constituents would be released from the facility into the surrounding environment.” Another study by the National Academy of Sciences is expected to be released next week. Environmentalist oppose the project. That would be enough to supply all the country’s nuclear power plants for about two years or all of Virginia’s demands for 75 years.